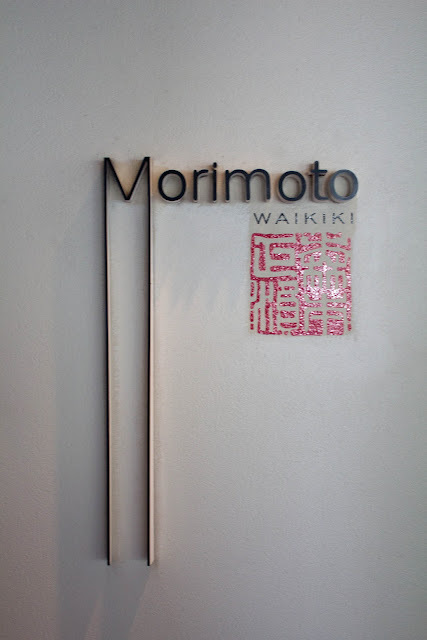 Recently I had the enormous pleasure of dining at Morimoto in Waikiki. 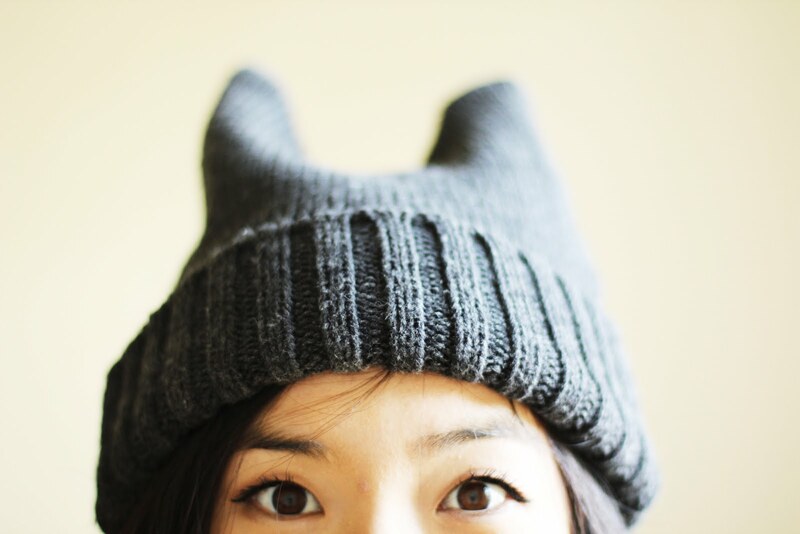 The name Morimoto might sound familiar to you and it should! Masiharu Morimoto is the chef that has gained infamy across the globe from his stints on the original Iron Chef as the successor to Koumei Nakamura, and on Iron Chef America. He has three restaurants in the United States, located in Philadelphia, New York, and Florida--and has two in India, expanding his reach to both Mumbai and New Delhi! My family and I were super excited to try the famed Iron Chef's recipes and experience his aesthetic. The overall decor of the restaurant is very fresh and clean; the aesthetic of the restaurant utilizes a palette of fresh celery greens, creams, off whites, and turquoises. 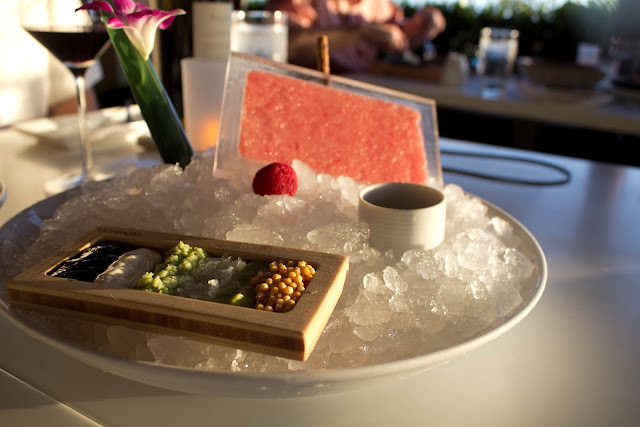 I think the restaurant did a great job of embracing Morimoto's modern cooking style and fusing it with the "Aloha spirit." The restaurant was really beautiful and I could easily imagine it being in some swanky movie with a couple of high powered executives having a relaxed lunch, but in reality there were a lot of casual diners! In a sweeping panorama of the whole restaurant, there was many a Hawaiian shirt and chino pant to be seen. The restaurant itself is very, very large with ample indoor and outdoor patio seating. 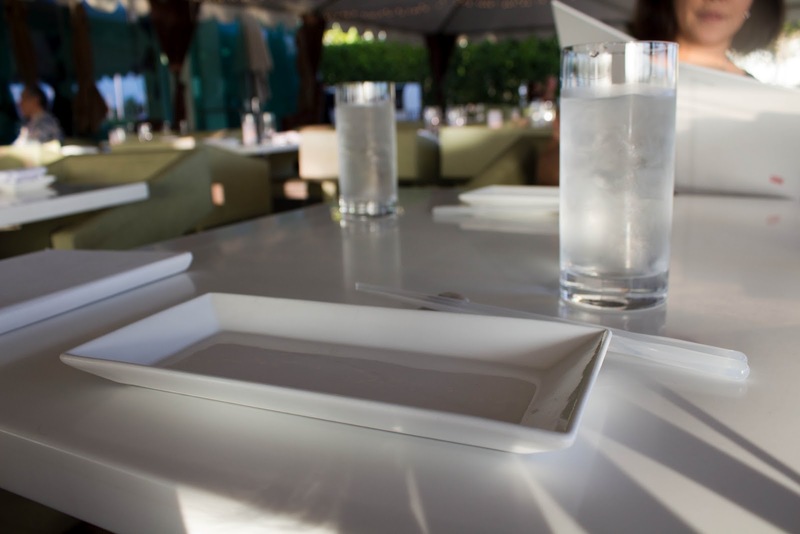 The space is clean, modern, fresh, and well designed (some of the beautiful vessels and plates that our food came served in was even custom ordered by Morimoto himself) and it seems like the restaurant itself is built for "high traffic." The hostess was friendly and seated us at our table very quickly, while the waiter that served us the entire night was friendly, talkative and never forgot to refill our waters. There was a small incident that I completely blame our waiter for and I will shamefully tell you the story. My family and the waiter were having a friendly conversation and I told him how I have watched Iron Chef ever since I was a child and how I loved Morimoto. 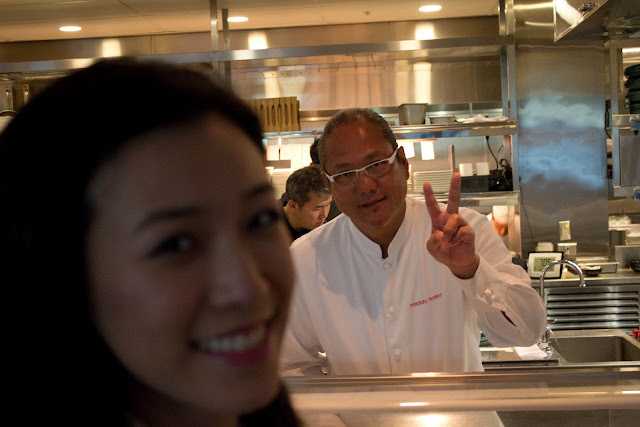 It turns out, in a freak coincidence, that Morimoto himself was visiting his restaurant and working at the sushi bar. Our waiter had told us that he doesn't mind taking photos with patrons and my father and I eagerly rushed over to the sushi bar to snap a photo. However, we learned after the fact that Morimoto doesn't like to be disturbed when working. He obliged us with a photo, however gruffly. Even though the restaurant itself was pretty empty, it was clear that he did not want to be disturbed when working behind the sushi bar. I was pretty embarrassed and Morimoto looks pretty gruff, but here's the photo nonetheless. Now onto the meal! My family had decided to order more of Morimoto's cooked and "innovative" dishes versus simply choosing the sushi "omikase." So you might not see as much sushi and sashimi as I usually post in a Japanese restaurant review. ;) I hope you still enjoy! This dish was beautiful and was the exactly what I had envisioned in a dish coming from the Morimoto kitchens. I found the presentation more complicated and artistic than the actual components of the dish itself. As you can see from the image above, the tuna tartare is pressed onto a small, translucent plate and accompanied by all the delicious sauces and yum, yums that are usually "pre-mixed" into the tartare. From what I recall, the condiments on the plate are (from left to right): a pureed seaweed sauce, sour cream, grated wasabi, grated maui onion, guacamole, and toasted rice crackers. 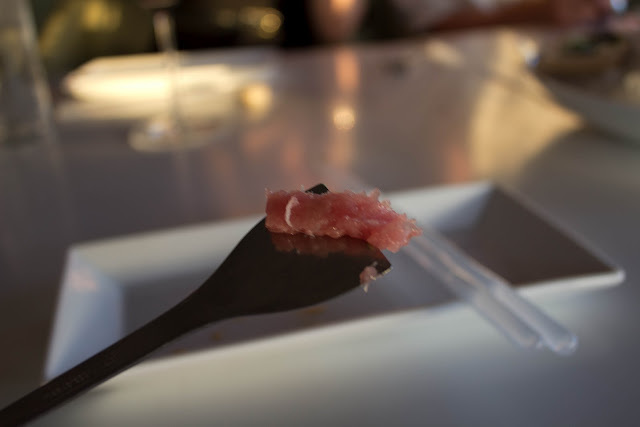 In addition to the wonderful condiments, the tuna is also served with some dashi soy-sauce. To eat the delicious tuna tartare, Morimoto gives you small stainless steel spatulas to scrape the tuna tartare out of the clear plastic dish, drag it across all the condiments, and finally dip it into the dashi-soy. I really, really enjoyed it. I think all the flavors, both traditional Japanese flavors, of the wasabi, rice crackers, soy sauce and seaweed, and the newer Hawaiian flavors of the Maui onion and guacamole blended nicely together. My only complaint about the dish is its pricing, $28, and the quantity of the tuna given. The clear plastic tray shown above is all you get--the tray itself only goes about half a centimeter deep and honestly, I feel like the price is too much to ask for such a small amount of tuna. However, I can see the reasons for the premium price....the celebrity chef, the allure of a celebrity restaurant, the beautiful presentation etc. Knowing the price and the presentation I would say that ordering this dish is an experience and it's up to you whether or not you want to pay for it. I felt that this was one of the dishes on the menu that just screamed decadence. Its components included indulgent foie gras, decadent uni, and rich teriyaki sauce. You guys know how much I love over the top decadent dishes...uni, foie gras, and generally fatty things have holed up in the most soft spots of my heart's arteries. However, this dish was sort of a let down for me in terms of the flavor harmonization. I love all of the dish's separate components equally, the oyster, the uni, the foie gras... but putting them together like this and dousing the whole thing in teriyaki sauce overrode all of the ingredients' flavors. The overwhelmingly dominant flavor of this dish was the territory sauce. I personally prefer raw oysters to cooked ones, and these ones were most assuredly cooked to well done. The texture of the cooked oyster was firmer and paired poorly with the seared foie gras. The foie gras itself was small, lending itself to an unusual firmness because of its size. Unfortunately, it didn't have that crispy exterior and tender interior that is inherent with most well executed pan seared foie gras. Lastly, the delicate uni flavour was lost in the dish. I couldn't even taste it! 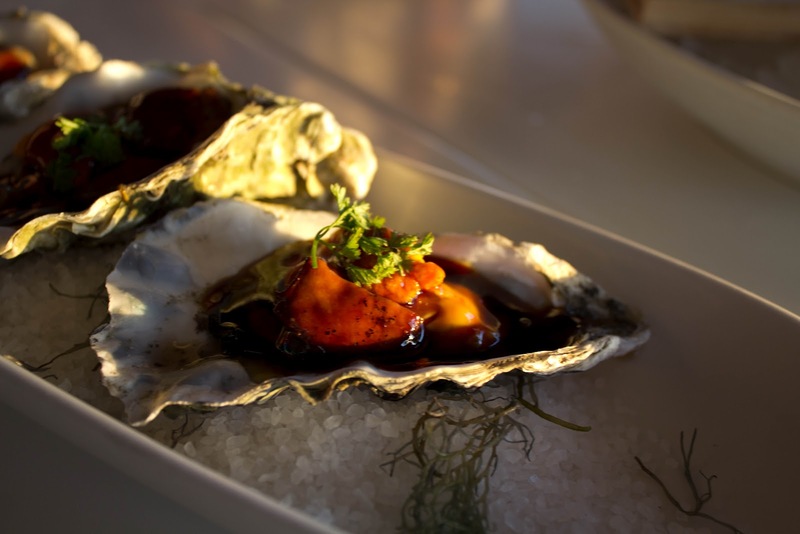 The dish was just two relatively firm pieces of "meat" (the foie gras and the oyster) swimming in teriyaki sauce. 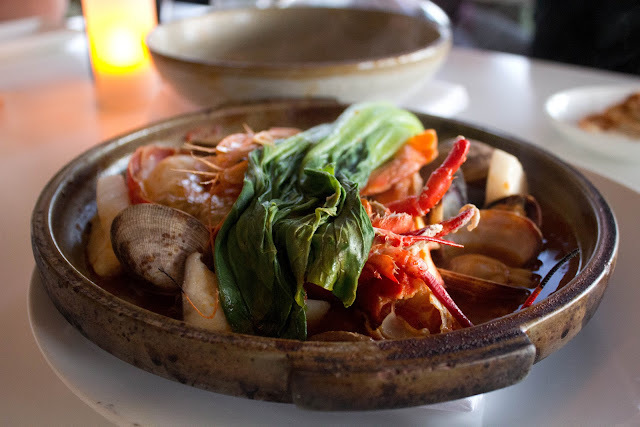 This is the Morimoto that my family has come to know and love throughout all this televised appearances on Iron Chef and Iron Chef America....the fusion of the east and west in an aesthetically and gastronomically pleasing way. What he's done is taken cold smoked yellow tail and heavily seasoned the exterior using a combination of traditional pastrami spices. To me, the taste was somewhat average and it really wasn't anything to write home about. The cold smoking technique allows foods to remain moist, while imparting a smokey flavor onto whatever it is that you want smoked....and the effect was nice in the yellowtail. Honestly, even though the exterior herbs were supposed to impart the main punch flavor, the predominant taste I remember was the cold smoked yellowtail, which was just slightly reminiscent of smoked salmon. My parents and I all enjoyed this dish, but I'm not sure if I would reorder it again. Now this is the cold appetizer that I would order again and again. The tako was fresh, had a nice bite and was perfectly matched with the ginger, oil, soy and the little bit of shichimi sprinkled on top. It was simple, well executed and delicious and probably by far my favourite cold appetizer of this round of orders. 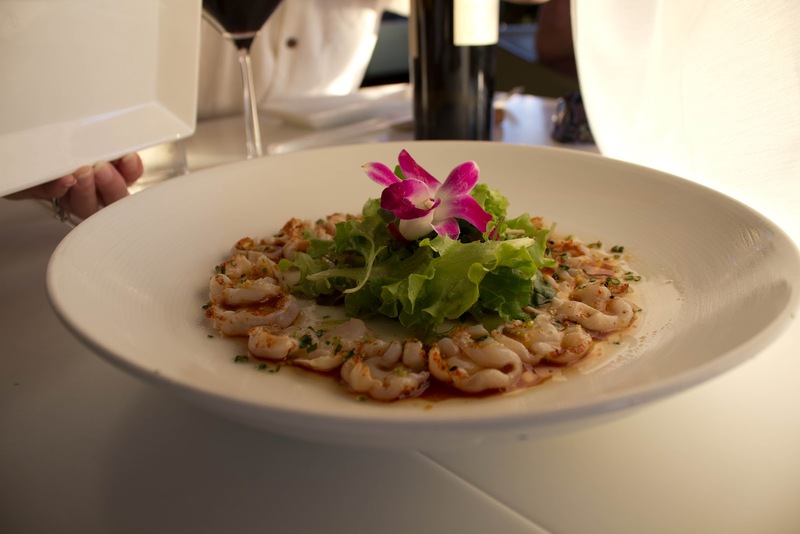 As opposed to some other "live octopus" carpaccios I've seen, mainly the Italian and South Korean versions, at Morimoto's they pretty it up by slicing the octopus meat into delicious standardized rounds and it makes the eating experience incredibly pleasant. It's kind of silly, but I'm always afraid of the live octopus eating deaths in South Korea...if you eat the octopus wrong it'll suction cup itself to the inside of your esophagus, in a desperate bid to save it's life, and you won't be able to choke and have difficulty breathing until either you or the octopus wins out. I guess you guys can see why I find this one so much more likable. >< Here's a video of Korean style live octopus. Tell me what you think about it! ;) I've never tried it myself, and as you can tell, I'm a bit afraid to, but we'll see if I ever go to Seoul; I may cross it off the bucket list. In this dish I'm sure you guys can see the Korean influence with the stone bowl method of cooking and presentation. ;) This dish also has a unique twist in it's flavor profile: as you can probably tell from the photo, this dish is mainly yellow tail, rice, and seaweed cooked to a crisp at your table. There aren't very many additional garnishes and vegetables added to this dish like the traditional Korean bibimbap and, through this, the yellow tail is really allowed to shine. Yellowtail is already a relatively oily rich fish and the whole bowl is imbued with the yellowtail flavor and oil. 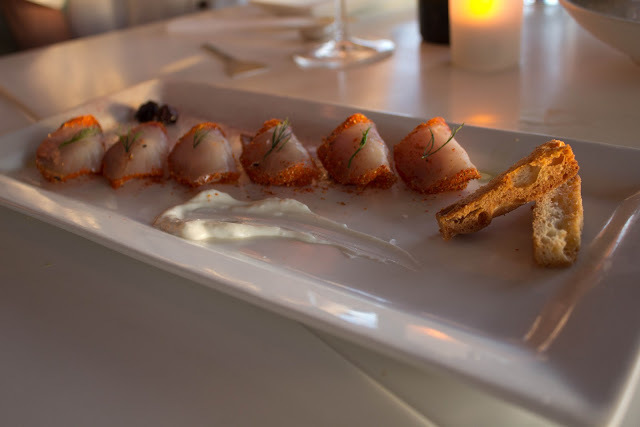 Each bite is almost buttery, richly infused with yellow tail flavor. 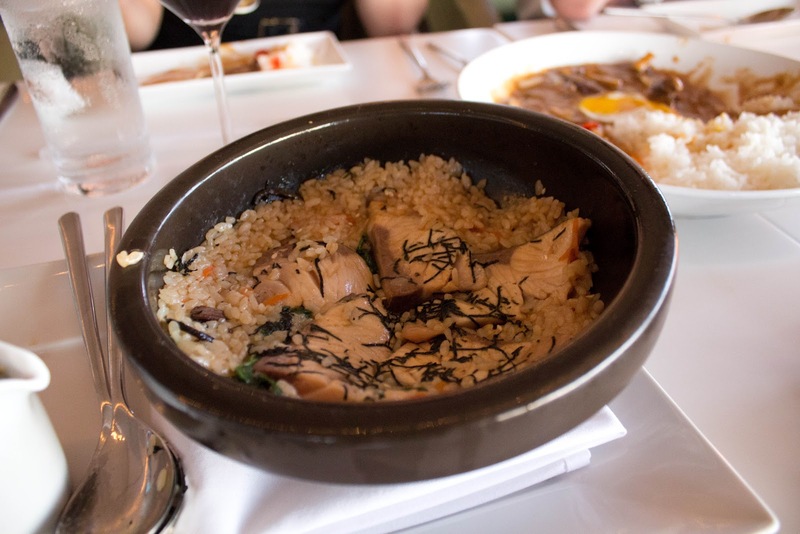 Because of the stone bowl most of the rice on the edges was transformed into a thick, cruchy crust while the rice within the bowl was soft, oily and flavorful. When I utilize the adjective oily, I hope you guys know I mean it in the good way, as in each grain of rice doesn't stick together and is perfectly coated in nom-nom fish oil. It was good, albeit a bit one dimensional to me. I'm not sure I would order it again to be perfectly honest. You might be thinking that I forgot to link the photo for this...but I didn't....it was the first main dish to arrive at our table and we were absolutely famished...so we destroyed it. You can see the Loco Moto above in the image of the "ishi yaki buri bap" hiding in the background. Loco moto is trypically known as a Hawaiian breakfast dish of a hamburger patty over rice with a sunny-side egg on top covered in gravy. Of course, at Morimoto's they fancy it up with wagyu beef, locally supplied farm fresh eggs, and hayashi gravy (a demi-glace that contains beef and onions that often contains red wine and tomato sauce and slightly resembles curry). In concept it was simple, but the components and freshness of the dish really made it outstanding. I mean who can turn down wagyu beef, extra special gravy and a runny egg? I LOVE RUNNY EGGS. This was a STRONG tart. That's all I can say. The chocolate was very dark, the caramel was incredibly sticky and rich, the kona coffee punched me in the face and the vanilla bean ice cream definitely needed to be there to mellow all the flavors out. 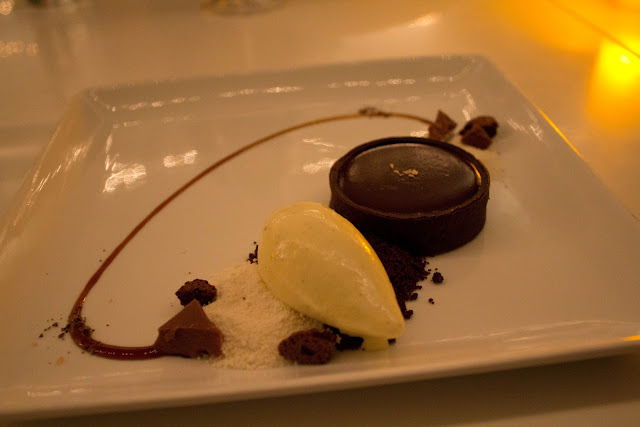 This is definitely not a light dessert in any way shape or form, it was straight up rich, cocoa realness. Cutting through the cake itself was actually quite difficult, and the caramel made the whole thing even harder to separate. To reiterate, it was just a rich, compact, complex cake. The reason why Morimoto was in town was because his restaurant was getting a new head chef stationed at the Morimoto Waikiki location and he wanted to try her out for a "test run" under his supervision first. 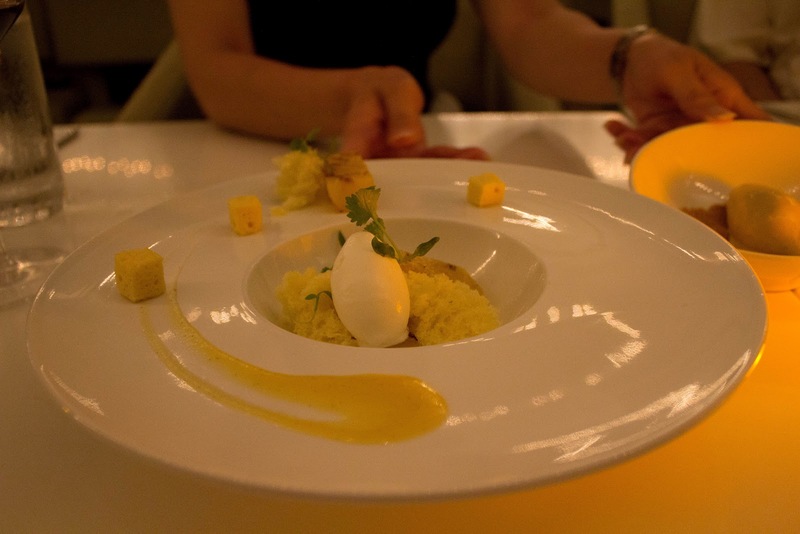 This was the dessert she had created: pickled pineapple and a rendition of a pineapple cake. To be completely honest, this dessert didn't interest me at all and I don't really remember it. What I do remember is my mother's reaction to it! She said she liked it and enjoyed the combination of sweet and tart of the main dessert dish, but disliked the taste of the pickled pineapple around in the dish. I believe she said that the pineapple was just naturally tart and the pickling process made the sourness overpowering. 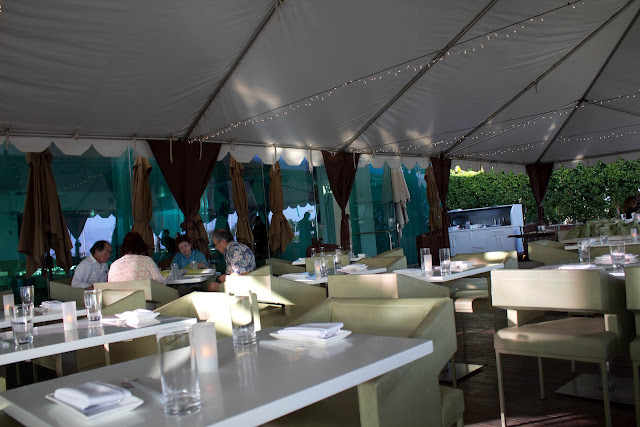 Dinner was so good at Morimoto's that my family went to return for lunch the next day. 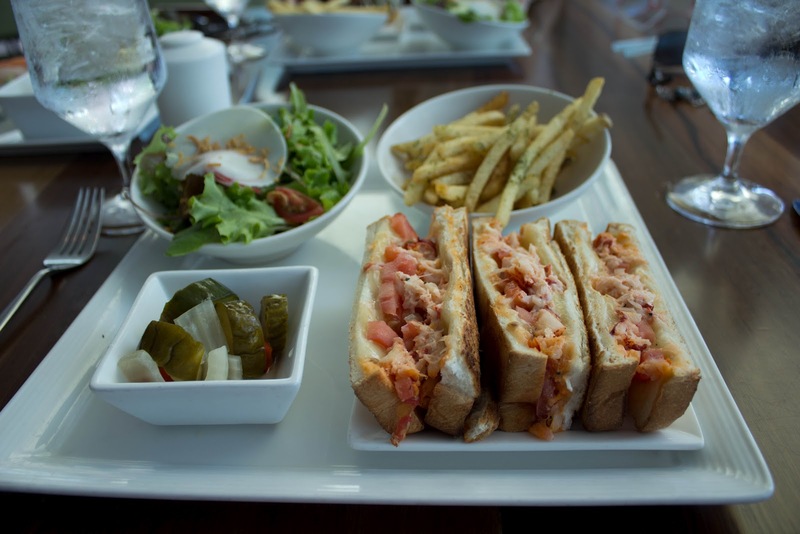 <3 Their menu is slightly different for lunch time, but many of the dinnertime dishes overlapped with the daytime ones. The only likely difference was that the portion size was a bit smaller--many of the items were turned into lunch sets. There is an additional sandwich section that isn't available for dinner on the lunch menu, and like the lunch sets, they are served with a miso soup and salad. Oh god. This lobster melt was heavenly, again my parents wanted to share and we all switched dishes so I only ended up with one sandwich left....which was terrible. I honestly think I would order this again and eat it all for myself. The amount of the lobster in this roll was much greater than all the other lobster rolls I've had before, but not so much it overwhelms you and gets the sandwich bread soggy. The miso mayo combined miso and Swiss cheese into an absolutely divine salty-sweet-creamy mix. The miso combats the creamy, rich natures of the mayo and the Swiss cheese, which lets the flavors to harmonize amazingly. I would highly recommend this sandwich, it's absolutely addicting and delicious. 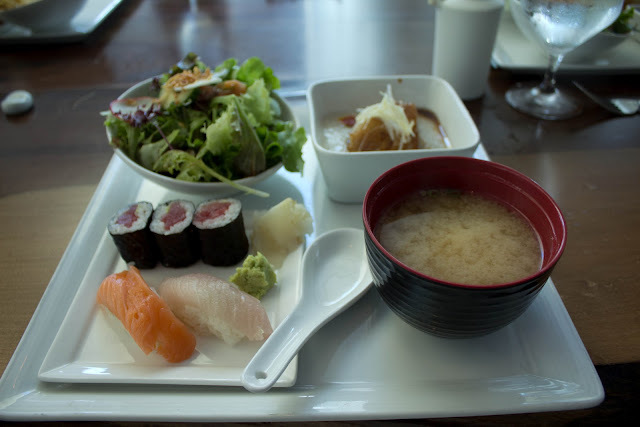 The salad and the miso were the same as the sandwich lunch sets and the sushi was fresh and delicious, albeit simple. However, my entire family absolutely raved about the black cod. It was tender, moist, and perfectly braised. Even the porridge was delicious! Usually porridge dishes are a bit too much for me, in terms of one dimensional flavor and portion size, but I feel that the braised cod and the ginger soy reduction were in perfect harmony with the porridge. It was a perfect sized portion for a great light lunch. 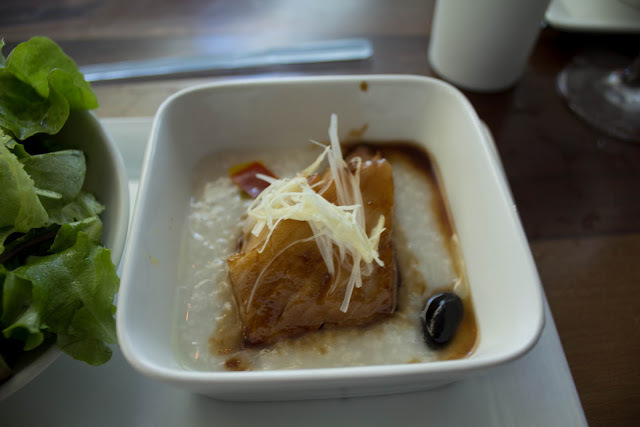 You can see how the budo mame, sweet-salty soybeans, and the pickled bell pepper dot the porridge. They add interesting bursts of sweetness, saltiness, and tartness to the braised black cod. Again a very light lunch, but one packed with flavor and marinated cod goodness. 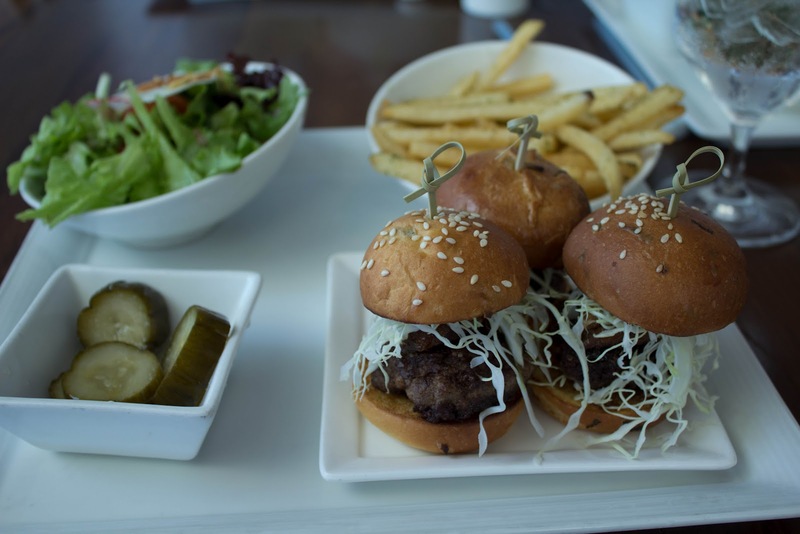 The little set of sliders are what my mother ordered for her lunch. Although this dish is the most popular....I think my family enjoyed this dish the least. The patties of these special burgers were a bit dry, which was strange because wagyu beef and pork kakuni are fatty, tender meats. I feel like the grinding and grilling process makes it difficult for the meat to retain its natural juices and you can often end up with a rather tasteless dry burger. The sliders were topped off with shredded cabbage, which was also pretty tasteless. The meal was pretty mediocre, and I think the inclusion of a sauce would have made it better. Don't let the tofu in the cheesecake scare you! I've had several tofu cheesecakes now, mostly at the different divisions of Guu in Vancouver, and I've found them all to be very good. The addition of tofu to the batter makes the cheesecake less sweet and more airy than a traditional New York Cheesecake or even the cheesecake from Cheesecake Etc. For me, the true start of this dish was the kuromitsu ice cream! Kuromitsu is a Japanese sugar syrup and is similar to molasses in flavor. However, unlike molasses, kuromitsu is much thinner in texture and it's incredibly addictive. The ice cream next to the cheesecake was my favorite part of this dessert, in fact, I just want to eat a big bowl of the ice cream without anything else. 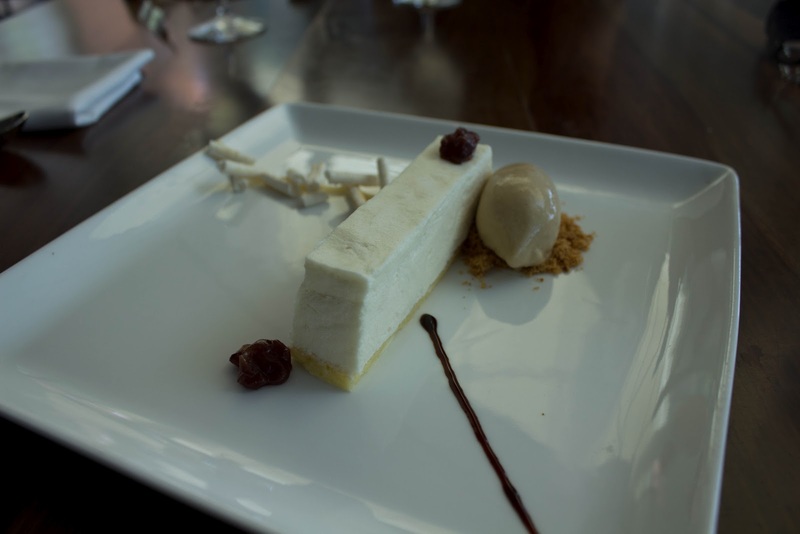 I would recommend the cheesecake as a "safe" dessert option and I encourage you all just to try the kuromitsu ice cream. It's difficult to describe, but the light sweetness of the brown sugar will take you in immediately. I highly recommend Morimoto's in Waikiki for anyone that's ever been a fan of Iron Chef and the Aloha Spirit. 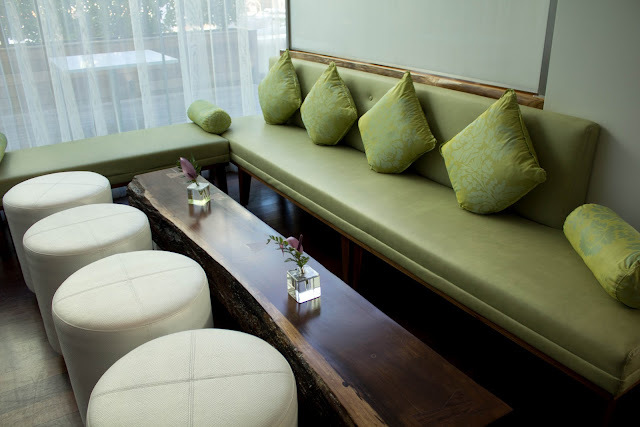 The decor is fresh, peppy and beautiful, while the service is high class, friendly, and accommodating. I find that ordering food off the menu reflects Morimoto's performances in kitchen stadium. Some dishes are out of this world and others are more aesthetically pleasing than palette pleasing. I hope I've given you guys a relatively good idea of what some of his dishes are like and you're able to put this information to use when visiting his restaurant. When I go next I think I'm going to try the ramen, it's what Morimoto himself ordered when he sat down to entertain some friends! Thanks for reading, and I hope you'll visit again soon.